Communities In Schools of Thomasville (CIS) works inside Thomasville City Schools full-time, building relationships with students to empower them to stay in school and achieve in life. During the 2017-2018 school year, CIS served nearly 2,400 students and successfully helped 98% of our case-managed students stay in school. Working with schools on a daily basis, our staff are able to identify and tackle non-academic challenges others might not see. We can address immediate needs from food and clothing, to more complex needs like counseling and mentoring. 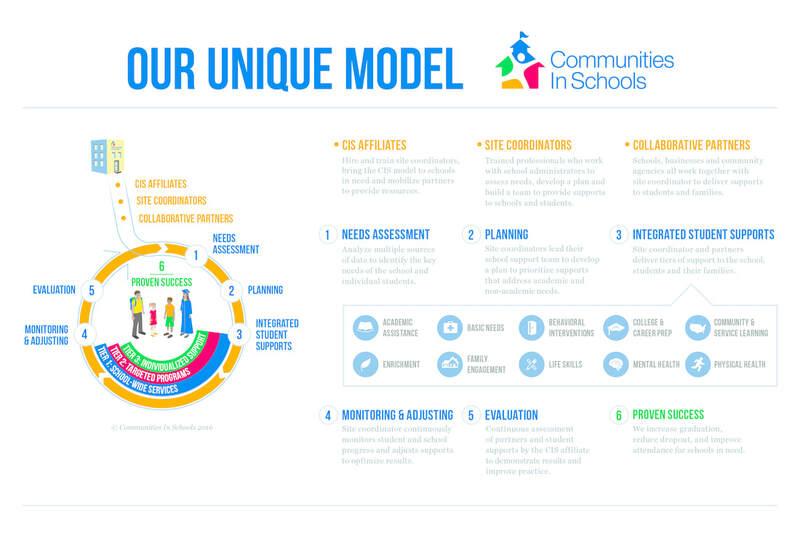 In 2015, Communities In Schools conducted qualitative research on a national level that concluded that CIS support services help kids stay in school and reaffirmed that CIS is fully committed to evaluation and improvement to ensure all kids graduate from high school ready to succeed. In Thomasville, 98.6% of students live in poverty. It can be hard for them to succeed in school and therefore hard for them to achieve a lifetime of success. But by placing caring adults inside our schools - to assess their needs and mobilize community resources around their needs - Communities In Schools of Thomasville helps at-risk kids succeed. We show students that completing every grade and graduating high school is well within reach. Nationally, Communities In Schools is the only organization proven to increase graduation rates. Every year we help thousands of kids to a bright future. When they succeed, we all do. April 1994 Judy Younts was hired as the first full-time director. Click on any diagram below to download a pdf file.